Suffolk Naturalist: Moth trap repairs fence! Another mild day yesterday and I saw my first pond skater of the year on my pond. Found out there are several species of pond skater so I'll wait until a few more turn up before trying to catch one to positively ID it. This mildish day also saw me getting out the moth trap again. This will definitely be more of a feature as I have now joined Garden Moth Scheme which means the trap will be out once a week. I did plan to have the trap out all night, however, as I lay there on the settee contemplating manoeuvring myself to my cosy bed, the weather came up on the beeb reporting of a steady, thick belt of rain heading up from the south. I prayed it wouldn't reach Suffolk by 7am, but the animation showed it would be with us by 6am, D'oh! Now, for those not familiar with Mercury Vapour traps, I'll explain why the rain is such an issue. Mercury vapour lamps get quite hot and without a rain guard (which I have yet to fit), the lamp is open to the rain falling on it which would cause the bulb to crack open and thus making the bulb unsafe to use. So now, at just gone midnight, I had to get back outside, collect whatever moths had been trapped and pack it away as quietly as possible so as not to disturb the neighbours (or the wife). Which reminds me of the other positive uses for a moth trap. Earlier in the year, we had a couple of windy nights which saw my neighbours fence panel between us, blown down. Now he's not the most amiable of neighbours and last year, words were had over another section of fencing that had been blown down. He seemed to think that the fence was our problem and not his and eventually he came round to seeing common sense and replaced the panel. Now the latest panel to have been a victim to the wind has been down for some time and nothing has been said. But lately, since the moth trap has been out shining out a beam of brilliant light in all directions, especially through the gap in the fence and into his house, the panel has now been swiftly replaced! So I may have found an answer to all those neighbourly disputes, a moth trap! Anyhoo, let me bore you no more with this nonsense and give you the pictures of last night's findings. Hebrew Character O gothica. Great name. What I love about the Hebrew Character is its scientific name Orthosia gothica, brilliant! Next was a O cerasi which I know I've had before but I thought I'd include it here to show you a better photo than last time. A nice little pattern for a little brown job (LBJ). 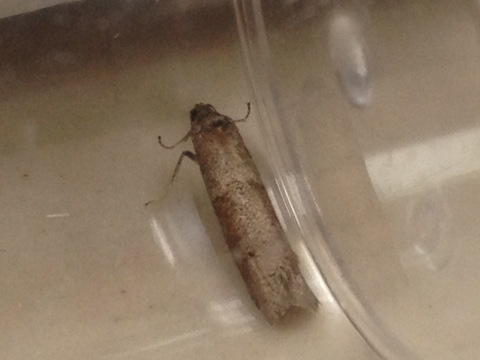 A dotted border appeared again, but in the trap this time on not the patio door. The next new species was another Orthosia, O opimai, the Northern Drab. Last on the list were two micro moths Tortricodes alternella, which, thanks to the help of Twitter and Les Hill of Dorset Moths were identified for me. So the moth trap has proved itself again in not only catching moths, but replacing fence panels too! Long live the moth trap.